Journey to enchanting Holland and travel the delightful countryside of the Rhine! One week each in personally selected apartments in Leiden, Holland and the German Rhineland. Airport transfer assistance upon arrival. 10-day Benelux-Germany Rail Pass, good for travel in Germany, Holland, Belgium, and Luxembourg; includes a 20% discount on KD German Rhine boats and limited bus/tram rides within Holland. Transfer between destinations: Train between Leiden and Germany, using your Benelux-Germany Rail Pass, and assistance for your arrival in Germany. Local info and Untouring the Rhineland and Going Dutch guidebooks, both researched and written by Untours staff, full of insider tips and sightseeing suggestions. 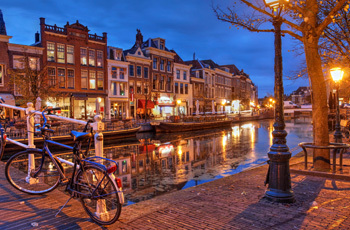 Cultural events in each location, like a guided trip to a German wine museum, a wine tasting, or a dinner; and Dutch fun, like a guided tour of the Peace Palace in the Hague, an Amsterdam walk, or a Pannekoeken (Dutch pancake) lunch.